Call it family tradition... My great grandmother crocheted, my grandmother crocheted, my mother crochets, guess it just runs in the family. I love making toys and items for my children. It makes them so happy watching their favorite characters come to life before their eyes. I feel like I would make my grandparents proud with my talents. I desperately need to be busy all the time. Crocheting keeps my hands busy and my mind working. I can't just sit down and watch a movie, I need to be dong something with my hands. I am a very creative person. I love making things and having creative outlets. 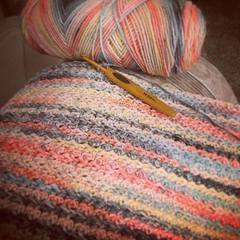 For me, crocheting is a wonderful way to be creative and to be productive at the same time. I also tend to have a lot of anxiety and the repetition of crocheting is very soothing and meditative for me. It is just a win-win all around!